Micropayments are pre-paid accounts that work only on your store site, similar to phonecards or giftcards. A customer can put in an initial amount and when it is used up, add more to it. Micropayments also save in merchant transaction fees by cutting down the number of transactions, since only adding funds to the MicroPay account requires running a live transaction through a gateway - all other micropay transactions stay on your site. To enable micro pay you should navigate to the configuration wizard and enable the micropay payment method. 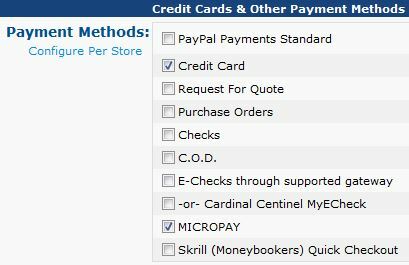 Micropay.HideOnCartPage When this is set to false, customers will have the option to add $5 to their MicroPay balance from the shopping cart page (see below for more details). Micropay.ShowTotalOnTopOfCartPage When this is set to true, customers' MicroPay balances will display at the top of the shopping cart page. In versions prior to AspDotNetStorefront 9.4.2.0 there is an appconfig parameter titled "MicroPay.Enabled" that needs to be set to true/yes. Store admins can change customer MicroPay balances through the Customers ? 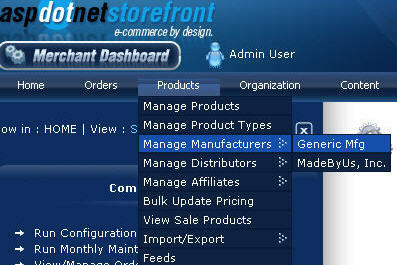 View/Edit Customers and Users page. Simply search for the customer whose balance you would like to edit, click on their Customer ID to pull up their account, and change the value in the 'MicroPay Balance' field. NOTE: This field only shows up once the MicroPay.Enabled AppConfig is set to true. Customers add more to their MicroPay balances by purchasing a product that shows up on the shopping cart page once this feature is enabled. NOTE: This product relies on the "Add $5 to my MicroPay account" product that comes preloaded with the software (mapped to the Generic Mfg in ML8 software). We HIGHLY recommend that store admins do not remove this product entirely. If you do not intend to use MicroPay right away, simply unpublish the product so it can be reactivated later if needed.